UVA’s Curry School of Education and Human Development is leading a major initiative to increase racial, religious and ethnic inclusion in classrooms, thanks to a $1 million gift from the Bank of America Charitable Foundation. At a time when the nation is deeply divided along political and ideological lines, the University of Virginia’s Curry School of Education and Human Development is leading a nationwide effort to help teachers increase racial, religious and ethnic inclusion. With a $1 million gift from the Bank of America Charitable Foundation, the Curry School and its partners will create and disseminate practical, evidence-based lessons and tools for educators around topics such as racial justice, ethnic diversity and religious inclusion. The project will leverage the power of education to combat intolerance and build bridges around challenging topics. By analyzing the root causes of intolerance and developing best practices for teachers, the initiative aims to understand how inclusion is taught – and put that knowledge to use in classrooms across the country. On Tuesday, UVA President James Ryan and Bank of America’s chief administrative officer, Andrea B. Smith, kicked off the initiative by co-hosting a panel discussion exploring the role that history and education play in increasing inclusion. Pianta moderated the discussion with panelists Kinshasha Holman Conwill, deputy director of the National Museum of African American History and Culture; Sara Bloomfield, director of the U.S. Holocaust Memorial Museum; Derrick Alridge, Curry School professor and director of the Center for Race and Public Education in the South; and Stephanie van Hover, professor and chair of the Curry School’s Department of Curriculum, Instruction and Special Education. They examined how difficult and challenging aspects of history can be brought to life in contemporary educational settings, drawing links between historical perspectives and contemporary civics – with an emphasis on the role of K-12 schools, higher education and museums in translating and exploring these ideas. Ryan, formerly the Dean of Harvard’s Graduate School of Education, spoke of his strong belief that education – particularly, the study of history and the difficult conversations it facilitates – increases empathy. “Promoting tolerance and inclusion by talking about history is an idea that is both timely and important,” Ryan said in his opening remarks. “It’s often easy, from a distance, to think that whatever happened in the past was inexorable – but it wasn’t. In these conversations, you start to understand that history. You only appreciate that by, I think, having these conversations. “I’m thrilled that this project is beginning,” he said. Teaching history forces reflection on sensitive topics like slavery and the Holocaust, and it gives teachers and students a moment to pause for reflection on difficult issues, Bloomfield said. “History provokes humility and critical thinking,” she said. Teachers face many challenges and demands in bringing these critical discussions into the classroom, Van Hover said. Standards and testing often reduce history into bullet points and sound bites: names and dates memorized for a test and quickly forgotten. Legislation, policies and politics limit teachers’ freedom to address challenging subjects, while textbooks present complex and nuanced topics as simplistic and one-dimensional. It’s the adults who get in the way, panelists said; most children possess both the ability and the desire to learn about challenging or sensitive subjects. “Even the very youngest kids can understand things like fairness,” Conwill said, referencing “Let’s Talk Race,” a successful program offered by the National Museum of African American History and Culture that introduces the topic of race in age-appropriate ways. But, in order to bring history to life, teachers need to acquire certain skills and knowledge – like how to create a safe, yet challenging classroom environment, how to guide evidence-based discussions, and how to teach critical thinking in the age of the internet. “We have to be ready, as educators, to introduce these topics,” Van Hover said. Already, the Curry School is home to a portfolio of research projects, coursework and outreach programs aimed at improving issues of racial and social justice. In particular, the newly formed Center on Race, Public Education, and the South and the Youth-Nex Center on Positive Youth Development both address racial and economic justice. The school’s highly ranked teacher education program also offers a range of research, tools, training and counseling programs aimed at helping combat intolerance and increase equity in classrooms. Now, that toolbox is growing. This new initiative with Bank of America will allow the Curry School to build on its existing bank of resources and enable the development of new materials, including research data, coursework, training programs and classroom supports. 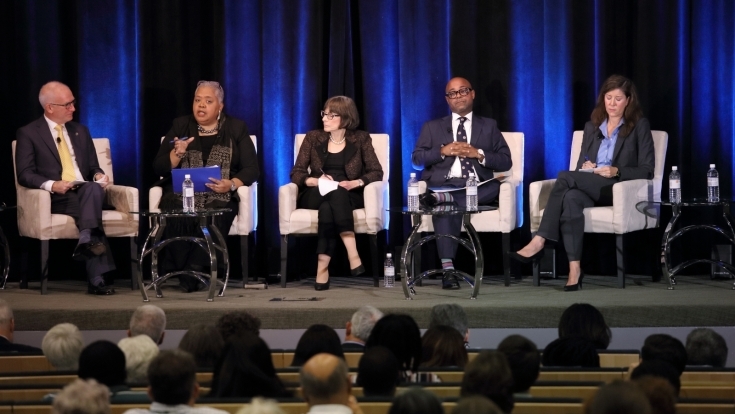 Ultimately, consultation and collaboration across disciplines will build a national repository of content, tools and best practices – research-based, tested and proven – for educating America’s youth on the issues of race, ethnic diversity and religion. “We are fully committed to making sure those tools actually get used – and used well,” Pianta said. He and other organizers hope the initiative will enable educators to tackle the challenges of teaching inclusion head-on and transform difficult and divisive subjects into tools to unite society, not divide it.